Let this moment be a personal warning to you about the incoming changes in the online marketplace. You aren’t making playing cards, what are you doing on Kickstarter? 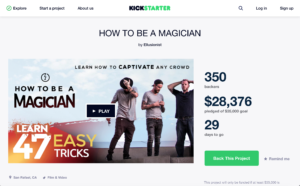 Why is a major magic organization raising funds for a project? Why are they releasing things already released in another form? They have the effects already, they have the talent already , the have cameras already, what part of this project needs $35,000 funding? Do I have an answer to any of those questions…. no I do not. But this is an informative post, not a disappointing one! Why would someone like me, someone against the mindless production of tricks, with the bolded thoughts from above be happy about this. But not because it isn’t great. It looks great, but it isn’t great for me based on where I am in my magic career. But, I want it to exist! Whether it’s created and then funded, or funded and then created doesen’t matter to me. It feels like a cool magic set for teenagers instead of kids. It’s a magic set for todays popular style of magic instead of the old fashion stuff. I would love for it to exist. Most importantly it’s a set with PLENTY of magic. What I mean is you could buy that set, and have enough magic for a weekly restaurant gig for 6-10 months. Im not exaggerating, I mean it! Michael Jackson spent more years performing “Beat it” then he did writing it. Why do magicians spend 10x longer learning and buying new magic then they do making it awesome in performance. I like Chris Ramsay. He’s a smart dude, he makes great youtube videos, great magic, he’s a magician being creative online and offline and I like it. When an artist that I like asks me to support a project of theirs, I always try to consider it. As the years go on, there will be more and more content creators just like this in every niche. If right now now there’s 1-3 magicians that you follow regularly online, in 12-24 months it will be about to be 5 – 10 if not more. People are going to ask you to fund their projects more and more. Where pre-orders used to be reserved for the most elite of things, now because of Kickstarter they are the norm. For someone to get successful support on a project that they haven’t created yet means they need to prove their value upfront. Discourse in Magic has not made any products yet. Why? We want you to like what we do FIRST, then you can think of supporting us afterwards. If the Kickstarter had 3 no name magicians create this product, they wouldn’t be 2/3 funded at the time I’m writing this. Like I voiced above: people like Ellusionist, People like Chris. People like Adam. People like Peter. These people have a proven record of creating great content, so when they tell us they’re planning something bigger we can support it! Recently our friend Andy over at www.thejerx.com opened funding for a second season of his magic blog. I check the Jerx every morning when I’m drinking my coffee. Finding and regularly reading his blog has added so much to my life inside and outside of magic, and I know that there are not that many people that are magicians, with the attention span and interst to read a blog, who are willing to support it. For $10/month of supporting his site he’ll post 3 posts/ week, send us a monthly magazine and some playing cards. If you also read his site regularly I strongly encourage you to fund the second season as well. I was so excited that this Kickstarter launch came out at the start of our media month! Media is changing the way that people do business and produce content every day. I think we’re going to see less and less people making money off of youtube in terms of making money on ads and things like that. But instead we’re going to see many many people making money WITH youtube (Using youtube as an example). Youtube is one of the tools they’ll use more and more to show their video content, but with that they’ll sell their own materials, downloads, tricks, goods, KICKSTARTER CAMPAINS or anything else exclusive. For some artists, the goal is still to hit a Billion views on your videos. For most, its to build an audience. To find the people in this world who like what you do, who want to see more of what you do, and want to support you in the creation of what you create. This is great! This is the benefit of the internet! Right now, 20 million people all sit down on their couch at the same time to watch “The Big Bang Theory” because there are only about 100 channels on the cable box. Instead of a fat white guy in a suit in a billion dollar studio deciding that a show will continue to be signed on and created for 6 more seasons, its thousands or millions of people at home enjoying or not enjoying each piece of content that dictates it’s success. One of the Youtubers with the most subscribers right now is a kid by the name Ryan ToysReview which is exactly what it sounds: a kid, whose grammar isn’t great enough to make a title, who reviews toys. Except the only thing is he has 5,000,000 subscribers, with some videos over 500,000,000 views. Who would have known he would be one of the top youtubers right now. He would have never had a spot on one of the 100 channels on your cable box. The benefits of more media channels, with more content producers, producing better products, more often is endless. If you’re in a place to financially support someone for creating the content that they create you should do it. Since they’re creating content for the internet, I’m willing to bet, that’s where they’re trying to make the bulk of their income from too. If you don’t have the means to support your artists or you don’t need their products but want to support them you can share their content with people who might appreciate it. Share it on Facebook, Twitter, Youtube, Insta, Snapchat, Email, Tell your friends, tell your family. You don’t have to do all of them, but make a point to do something. I hope you now understand why I made a blog post telling people to buy a product that I’m not myself going to buy. Gilmore Guys – A Gilmore Girls Podcast I listen to very regularly – Attended their live show, bought a shirt, used their meundies code. Smart Passive Income Podcast – a company all abuout making “passive income” online – Bought his book and signed up for a product that he gets regular commissions from.